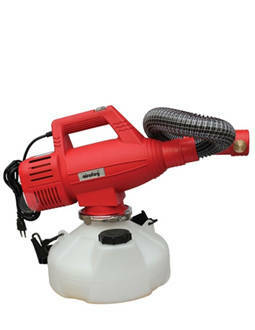 Airofog professional cold foggers U260 / U120 and U240 / U110 are portable ulv applicators powered from a 240/120 volt AC electric supply. A reliable and powerful electric high speed (35,000 RPM) ac induction motor and fan create very small spray droplets, in the 15-30um droplet size range, by using a vortical air shear nozzle. The fine aerosol droplets will remain airborne for an extended period of time and are dispersed over an extensive area by the powerful air outlet at the nozzle. The U260 / U120 model has an extendable hose that allows the operator to direct the fog into difficult to reach areas and spot treat where necessary. Airofog ULV (ultra-low volume) cold fogger model u260 and u240 are in ce conformity in scope of ems directive.